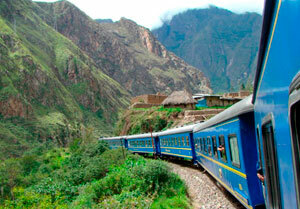 Our two day train tour to Machu Picchu takes you on one of the most incredible train journeys in the world. Following the route of the Urubamba River all the way to the cloud forest that surrounds Machu Picchu you enjoy the beautiful scenery of the high Andes throughout the course of the journey. On arrival to Aguas Calientes you check in to your comfortable hotel for the night and get a good night’s sleep so you can be up at the crack of dawn to visit Machu Picchu the following day. Leaving from Cusco 8.00 am we’ll travel by bus to the village of Ollantaytambo in the Sacred Valley where we’ll board our train untill Aguas Calientes. 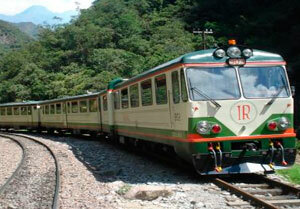 With beautiful scenery throughout the journey the train journey itself is an experience. Following the course of the river down the Sacred Valley you’ll arrive to Aguas Calientes by about lunchtime and after checking in to your hotel you’ll have the afternoon free. If you want to take advantage of your free afternoon you can visit the Machu Picchu museum and orchid exhibition which is a 35 minute walk outside of the village or you can just relax in the hot springs that the village is named after. Tour a Machupicchu “The lost City of the Inkas” After getting up early , we climb to the Inca citadel of Machu Picchu by bus and we can appreciate the spectacular sunrise this marvel and we will have two hours with our guide . Optional: can make the trek to Huaynapicchu this will take about 2 hours round trip (no guide and $10 usd plus). Then you will be given free time to stroll through the citadel. 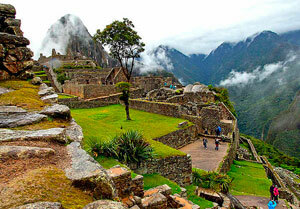 They will have all morning to Machu Picchu to take pictures and be in this mystical place. Then descend by bus to Aguas Calientes in the afternoon and take the train back to Ollantaytambo, where our staff will be waiting for you, to transport you by bus to Cusco arrive to cusco 22.30 hrs aprox. service end. travel insurance for the duration of your trip.